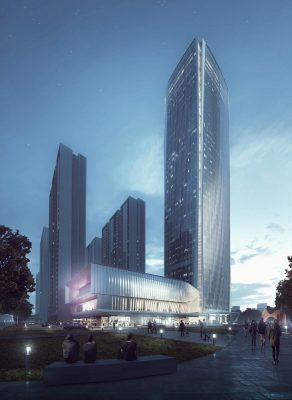 The Keyne Sailer Centre currently under construction is a large mixed-use development expecting completion in the second quarter of 2019 just north of the Nanjing, Jiangsu province in China. The Center will be the first phase of Yangzhou City’s latest new city masterplan for the Gaoyao Government and Commercial District, and it will feature 200,000 square-meters of both Grade-A speculative office and municipality government office spaces, a Five-Star Sky Hotel and Service Apartment complex, commercial street retail, and high-end urban residences. 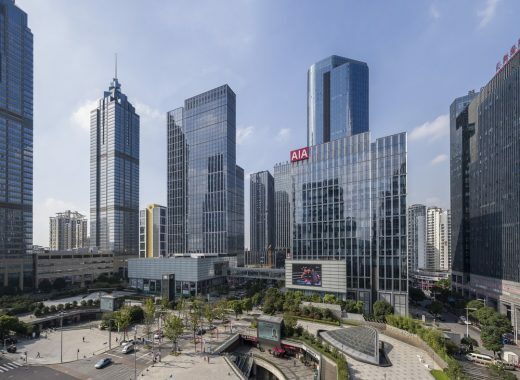 ”Gaoyou”, translates literally to “High Post” in Chinese, which underlines the significance of Gaoyou Lake, directly east of the project site and one of four largest lakes along the ancient Grand Canal trade route linking Hangzhou and Beijing. As Yangzhou prides itself as a city woven together by its canals, lakes and parks, its Gaoyou masterplan has been founded on this concept and The Center provides Gaoyou its first precedent landmark and a gateway to this natural lake district setting. 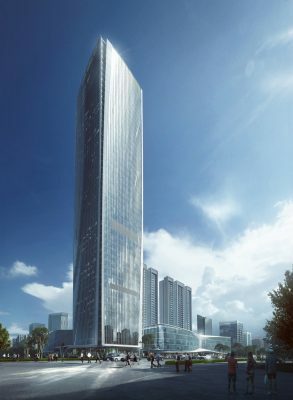 A 200-meter landmark office tower, divided into three zones of speculative offices, service apartments, and sky-hotel, anchors the Southwest corner of a major city center intersection of an east-west civic corridor and a north-south commercial corridor. 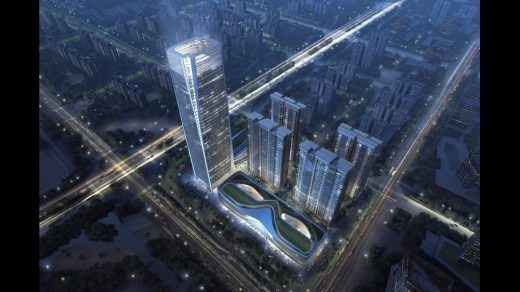 Its long orientation to the east and west commands views down the park system of the civic corridor and ends with Gaoyou Lake to the west. 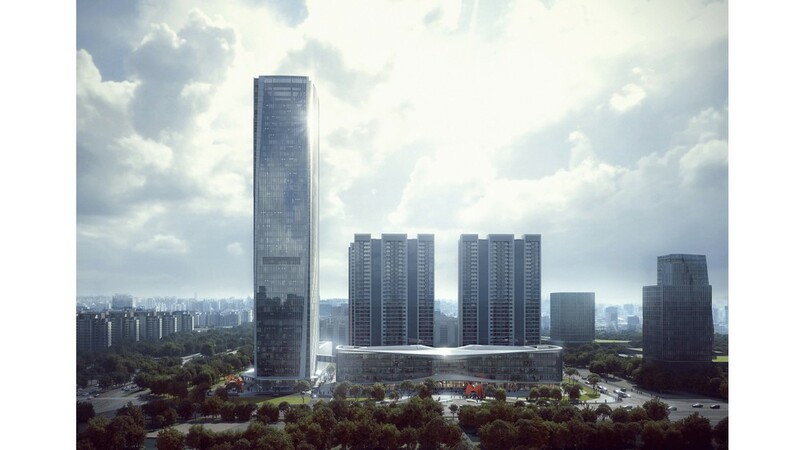 Extending south, the tower podium of hotel exhibition and conference and high-end retail activates the large north-south commercial avenue. Extending west, via a double-story indoor bridge, the tower links to the five-story government office podium which weaves into the east-west citygreen and government avenue. 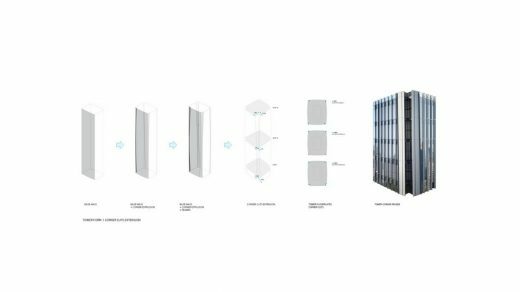 These edges provide the gateway urban image, while enclosing a private, more intimate series of retail courtyard gardens for a 24-hour mixed-use work and living lifestyle. 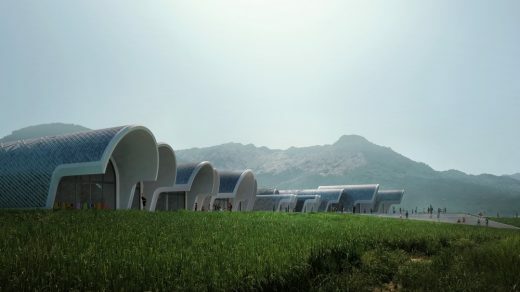 Gaoyou’s Lake District provided the inspiration on centering on the concept of the “wave”. 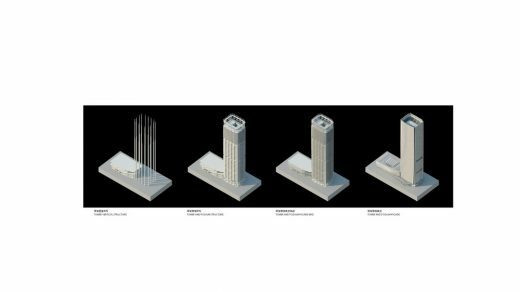 Bold but subtle moves helped drive toward an elegant urban and sustainable solution with a highly rational and efficient program. The tower elevation gradually rotates to open to corner entries and views, while a series of vertical aluminum fins that shield from solar heat gain to the east and west, gradually transform in section to create a dynamic visual effect of a wavelike-moving facade. 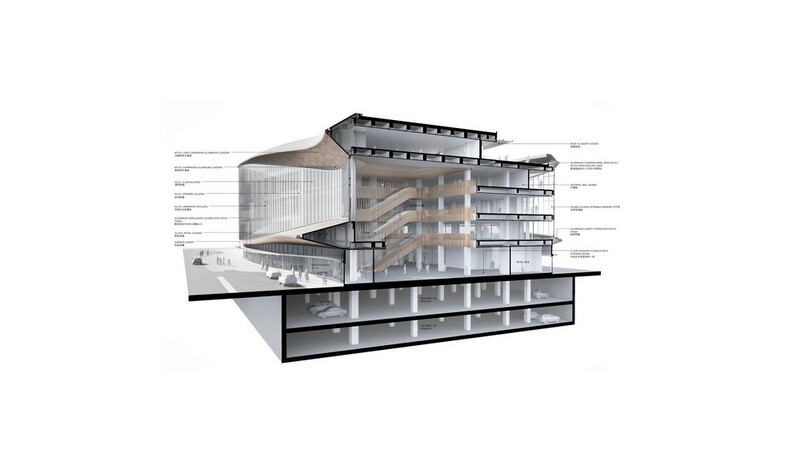 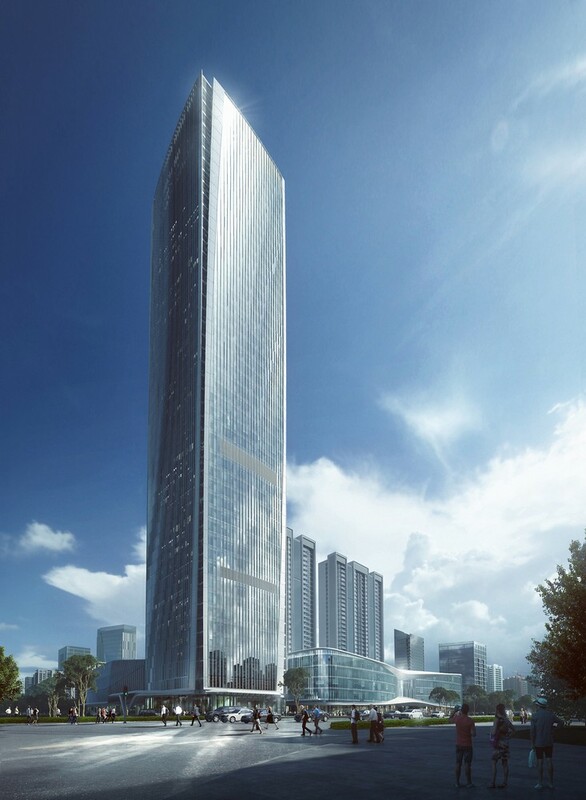 The tower’s apex allows natural light to pour into a central atrium-well for guest rooms. At the hotel podium, solar energy is stored in fully photo-voltaic roof that supports the hot water demands of the office tower while the top floor ballroom can open to a super-balcony for a fully outdoor experience. 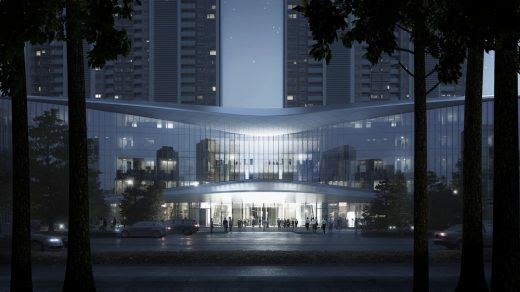 The bold sweeping gesture of the Government Office Podium is both a narrative to the Gaoyou Lake as well as the local municipality’s goal to open its doors to the community it directly serves. 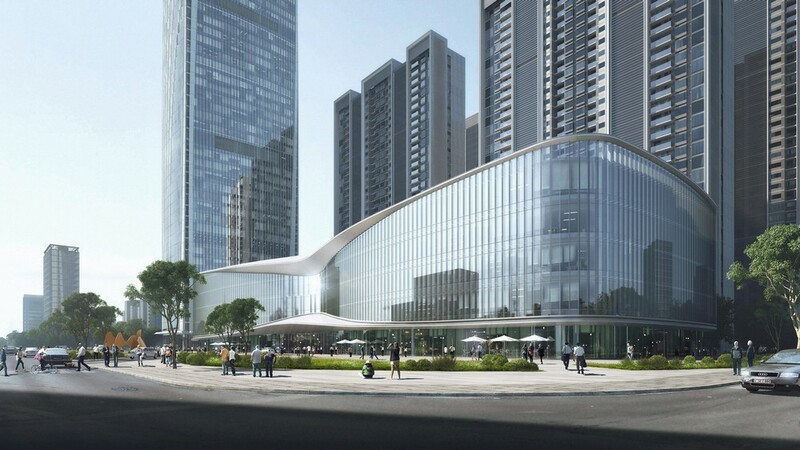 In contrast to fortified walls, the complex features a more transparent facade that balances daylighting and provides expansive views to the city green. 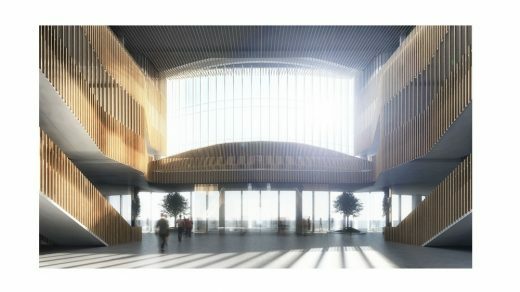 Two flowing horizontal planes help frame views while reaching and embracing the public realm while providing a ceremonial entry to its central atrium. 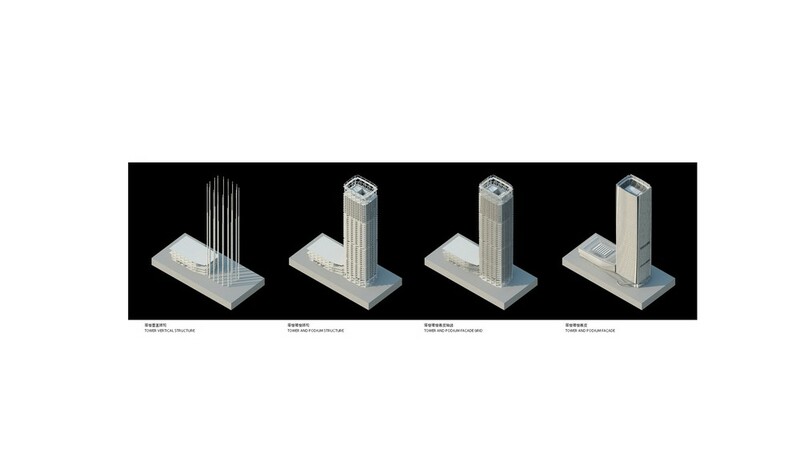 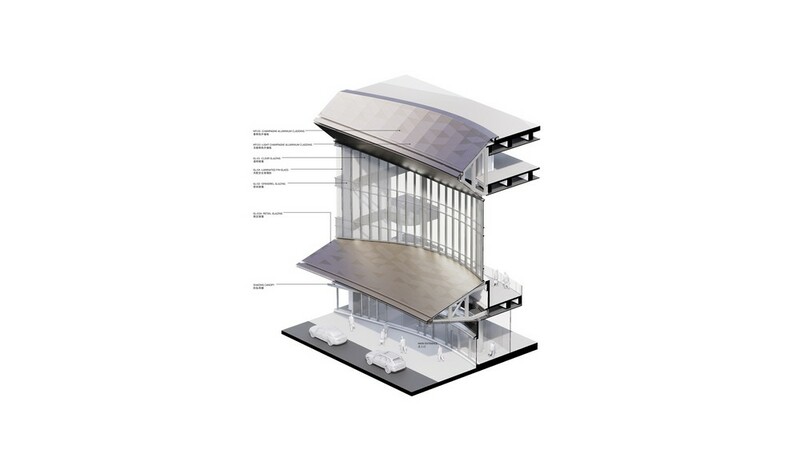 As an extension of the office tower, a series of vertical fins regulate the solar gain and gradually transform in profile and spacing to disappear at the central north entry to allow maximum daylight while providing greatest transparency for the public. Materiality and light celebrate nature within the interiors while encouraging a more intimate government office setting. The spaces are centered around three central light wells: a central atrium that is the forum for the community and its government and two interior atrium spaces that encourage collaboration among government departments. The 24-hour central atrium activates an entry to the interior retail avenue linking residences, offices and government functions. Within the interior atriums, office space is organized around the vertical atriums using meeting hubs and hot desks reflecting a mobile, integrated, and high-tech workplace. 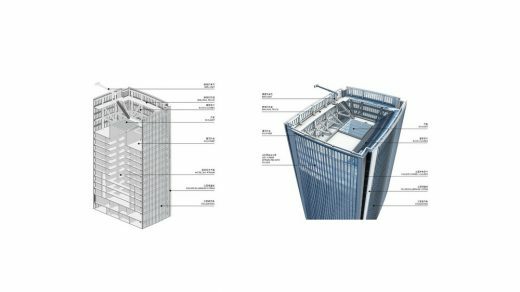 Finally, a roof garden and terrace dining area provides the final common shared space for all government and office employees of the tower and podium. 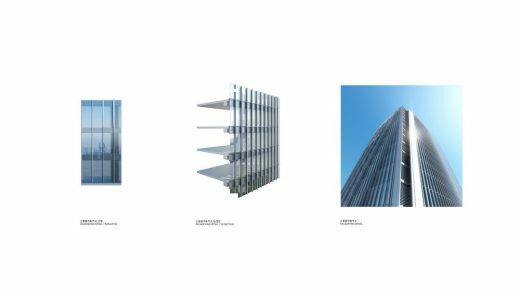 At the heart of the site, intimate views are captured within the project as well as broad views beyond to the city green and the lake.